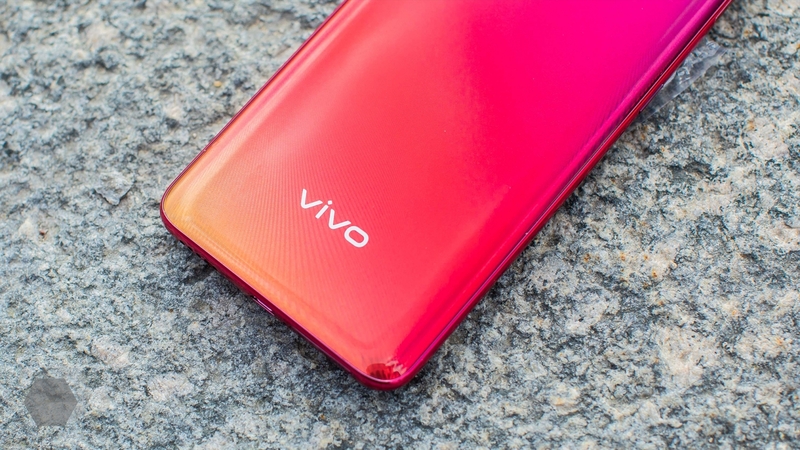 After exploring several Vivo smartphones, I came to the idea that I want to convey to you – Vivo does not make the device from the category “top for my money.” That is, the pricing policy of the company implies saving on some elements of devices in favor of adding features to them, which should not be at the selected price category. 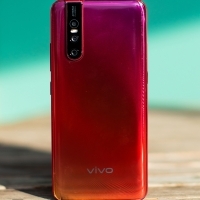 The proposal above describes the ratio of disadvantages and advantages in the Vivo V15 Pro – the company’s “top-end” smartphone after the NEX as briefly and accurately as possible . And before the review you should know something else: the official price tag for this device is 33,990 rubles for the only modification of 6/128 GB. And now let’s go to the device. 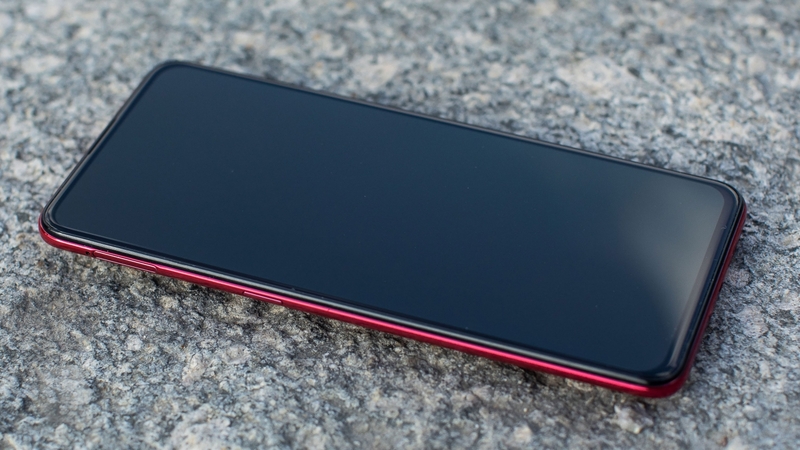 In Vivo V15 Pro, there are a couple of solutions that go to both harm and benefit. Take the case. It is entirely made of plastic. For such a price (and even less) you can find competitors from metal and glass. However, plastic allows a good “throw in weight.” Being a 6.39-inch “shovel,” the V15 Pro weighs some 185 grams. 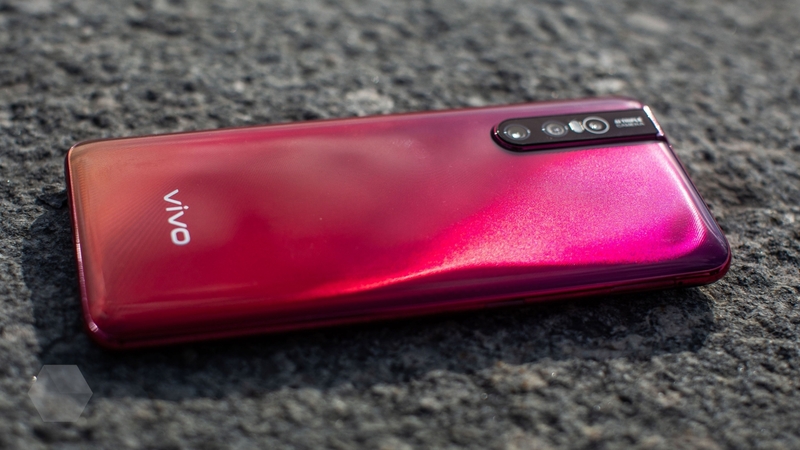 After the iPhone XR, which in the case “rolls over” for all 200 grams, the Vivo smartphone seems fluffy. In fairness, it is worth noting a phenomenal assembly. A copy that fell into my hands completely refuses to squeak, crunch and bend. In addition, I like the back panel shell texture playing in the light. It is complemented by two colors with a gradient: “Blue Topaz” and “Bright Coral”. I have the last one. “Raisin” adds a massive triple module of the main camera, highlighted in black. Honestly, iPhone-like round modules with a vertical arrangement have already become boring, and therefore a plus sign of Vivo for such a decision. The only complaint to him: he strongly sticks out from the case, and therefore the V15 Pro will not lie quietly on the table. This is the problem of most modern smartphones, it is solved with covers. 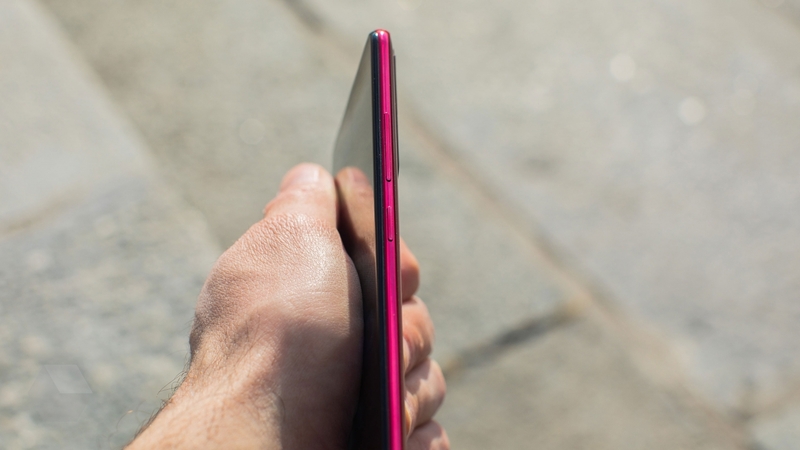 Only a smartphone got to me, but complete with the PCT version of the V15 Pro will be a nice case with a strong “bumper” and a transparent panel. But I’m not sure if he will “match” the camera with the back surface of the device. In any case, will not be superfluous. As for the buttons and ports. 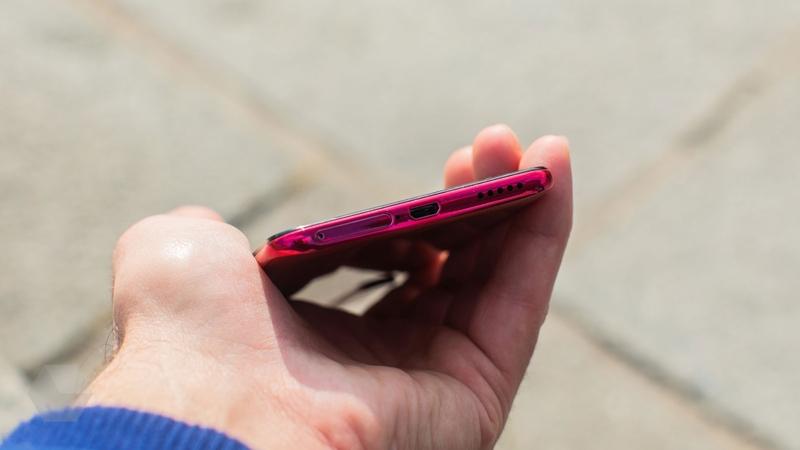 At the upper end we see a headphone jack, on the right side a volume rocker and power button, on the left – a voice assistant key (configured for Google Assistant) and a slot for a microSD memory card, and at the bottom end – a slot for two SIM cards, speaker and microUSB port. You know perfectly well without me that you can already find Type-C in smartphones for 13 thousand rubles. I will not focus on this. About the keys you need to know the following: it is easy to reach them, they have a clear move and, no, I have never confused the assistant’s button with the power key. But this does not mean that this will not happen to you. 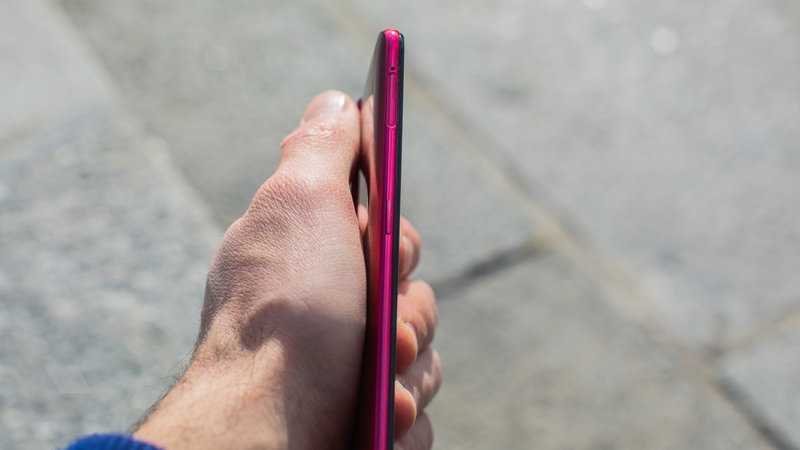 On the front panel of the smartphone under a rounded 2.5D glass is a 6.39-inch Super AMOLED-display without any cuts and “pegs”, with a resolution of 2340 × 1080 pixels and a built-in optical fingerprint scanner. Traditionally, for all AMOLED-displays, which I met in Vivo smartphones, there is a rich picture with a deep black color and a slightly elevated color temperature. You can notice bluish tones only when compared with any other device. Of course, the color rendition is adjusted in the settings. With extreme deviations from the right angle of view across the display runs a rainbow. But I assure you, no one will look at this large frameless display. So worry about it is not worth it. As I said above, under the display there is an optical fingerprint scanner, when your finger is highlighted by the screen, and the light reflection returns to the fingerprint sensor, passing through the display. Vivo is not the first time using this technology, but because I do not see anything surprising in her good work. The word “good” is no accident here. The fingerprint sensor in the Vivo V15 Pro rarely misses and quickly recognizes a finger, while modern conventional sensors do it without a miss and with lightning speed. The location of the sensor allows you to unlock your smartphone blindly. Enough to practice a little. Compared with the same NEX, the V15 Pro Vivo has made a significant step forward in the development of a fingerprint scanner under the display. At the same time, the company also worked on the sliding module of the camera. In Vivo, they say that in the V15 Pro, the front camera with a resolution of 32 megapixels leaves in 0.46 seconds, while in the NEX , according to my observations, the module “climbed out” from 0.8 to exactly one second. Along with the increase in the “speed” of the sliding module, the company added face recognition technology, which I like more than a fingerprint scanner under the display or anywhere else. Why? Because with it for identification it is enough to look at the smartphone. It is so simple! Unfortunately, apart from Apple, nobody really took it. 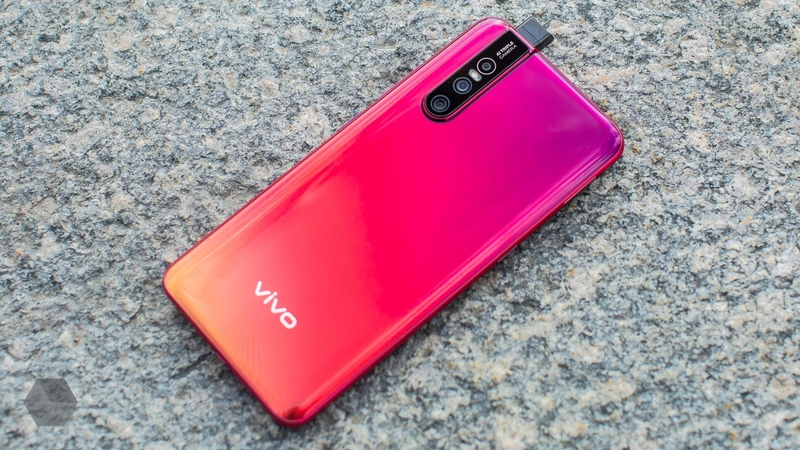 In Vivo V15 Pro, as in many other Android smartphones, only the front camera is used for face recognition, which means you don’t need to trust such identification too much. Anyway, I like how fast the front camera “climbs” out of the case, scans my face and “runs away” back. The whole process takes about half a second. But, as I said, it is not safe. In addition, this unlocking does not work in moments when the smartphone is on the table, unless you “hang” over it. “In the iPhone, for a lot of money too!”, You exclaim. “Nothing of the kind!” I answer. The second-generation TrueDepth camera quietly recognizes my face when I look at it at an angle, but this is not about now. Returning to the sliding module, several more points should be noted: the foolish activation sounds of the module have not gone away, they can still be turned off in the settings, the resource of the mechanism is more than 300 thousand cycles, according to Vivo statements. 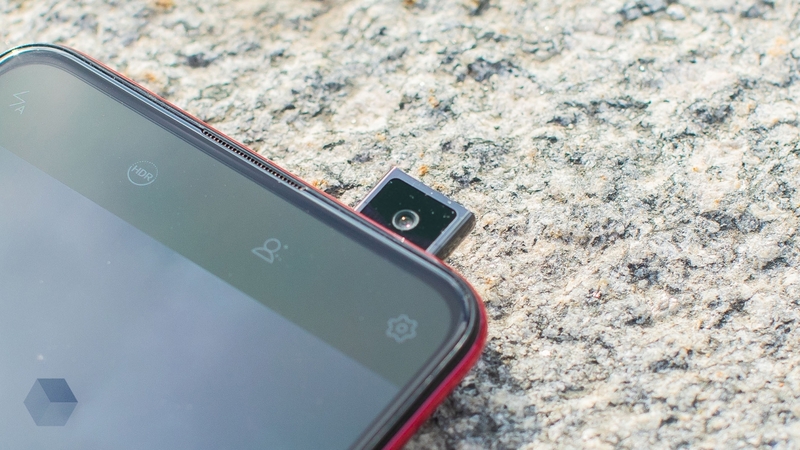 The updated fast mechanism with a large resource should not create problems for lovers of selfies, but I still tend to think that the sliding front camera module is still made for those who almost do not use it. That is for me. Anyway, it is thanks to the slide-out module that both groups of users can enjoy a large 6.39-inch display with the case dimensions modest for such a diagonal, and also not be afraid of evil hackers or unscrupulous software developers who spy on users through the front camera. In conditions with good lighting, the front camera takes clear pictures, but in a dark environment, most of the shots will be blurry. With the triple core module, the situation is different. Both during the day and at night I find the quality of the photographs obtained as average. The main sensor of 48 megapixel (Quad Pixel, f / 1.8), the wide-angle module of 8 megapixel (f / 2.2) and the depth sensor of 5 megapixel (f / 2.4) are responsible for this. At the expense of the main 48-megapixel sensor, it should be clarified that the resulting images, if you do not activate a special mode, have a resolution of 12 megapixels, because Quad Pixel technology combines four pixels into one to capture more information. 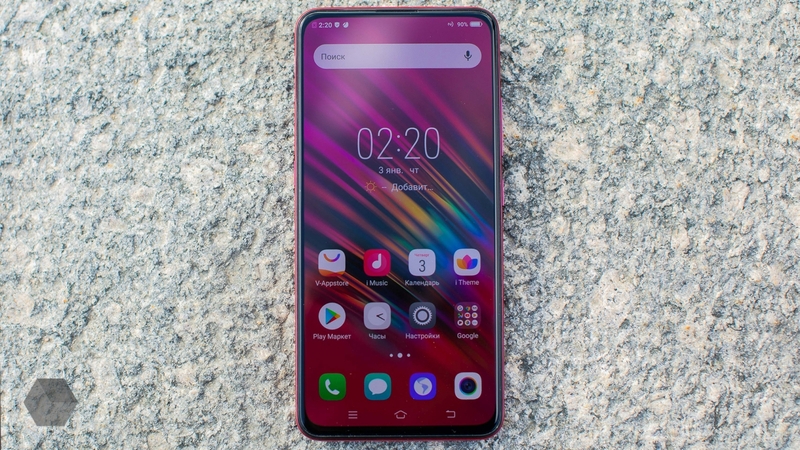 The Vivo V15 Pro runs on an Android Pie with the Funtouch OS 9 shell, in which I did not see any striking differences from previos builds I encountered on the NEX, V11, V11i and V9 Youth . There is also an abundance of useful options, such as a motorcycle mode, a custom Always On screen, gesture control, one-handed control mode, which is damn difficult to call, branded SMS application requirements and a control panel that “crawls” out of the bottom of the display. And I almost forgot: from here the taste of iOS has not gone away. If on other smartphones Vivo Funtouch worked just fine, then on the Vivo V15 Pro I was amazed at its smoothness. Believe me, the fact that a user who is spoiled by the “smooth” animations of iOS 12, Funtouch’s work does not cause any complaints – this is an indicator. True, the speed of opening applications from the sky of stars is not enough, and the performance of some games leaves much to be desired. And I think the whole thing in the processor. Snapdragon 675 is clearly not what most users would like to see for 34 thousand rubles. It is complemented by 6 GB of RAM. Together, this “couple” copes well with everyday tasks, which cannot be said about games . Asphalt 9 severely slows down at low settings, PUBG goes 30 fps at high settings with occasional drawdowns during “aggressive” driving on vehicles. In general, there can be optimization problems in large titles with the 675th dragon. It would seem that with a 3700 mAh battery, the Snapdragon 675 should surprise you with battery life, but the performance cannot be called impressive. If you immerse yourself in the world of mobile games, the battery can be discharged in 3.5-4 hours maximum. In the framework of mixed use for the whole day you can count. Vivo V15 Pro – a smartphone out of the box. 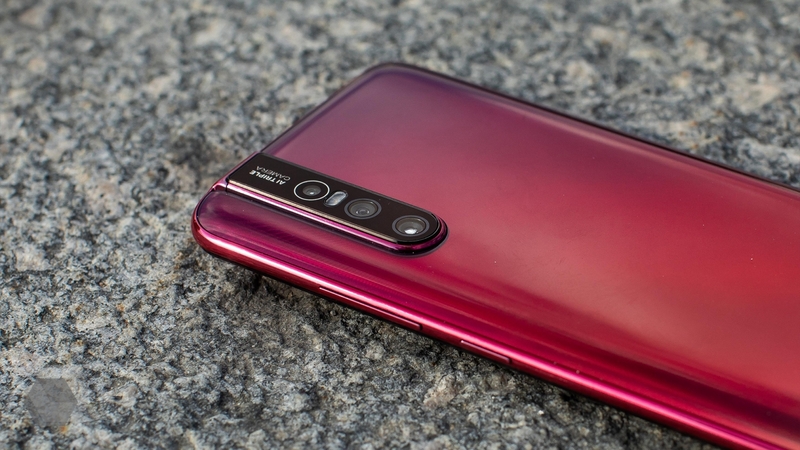 It has a sliding front camera module, a triple main camera and a fingerprint scanner under a large frameless display, which is not found in most smartphones for 34 thousand rubles. But at the same time, though he has a beautiful, as well as phenomenally assembled, but still plastic case, a prehistoric microUSB and a weak processor for this price category. Of the additional “buns” V15 Pro can be noted NFC, Bluetooth 5.0, fast charging, a slot for a microSD memory card and a 3.5-millimeter audio output. Is the game worth the candle? It is difficult to answer.